The bogie is the integrating component of the JPods system. It sits inside the guideway and supports the JPod. The bogie consists of a small electric motor that powers the traction wheels, used for moving the bogie along the guideway. 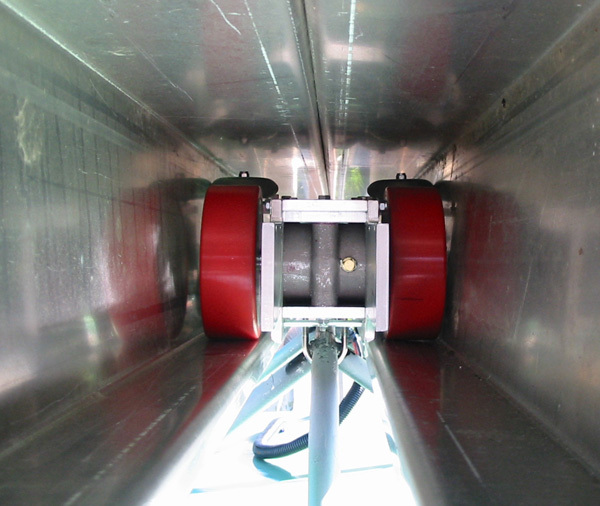 Guide wheels are mounted horizontally on each side of the bogie, keeping it centered within the guideway. The top of the bogie has boss that moves right or left and is used for switching. The bogie also has a electric brush that allows for the transfer of electrical power from the solar collectors above the guideway to the electric motor, the network control system, and the environmental control system via the onbaord battery.